So I am keeping it short and sweet today. I have the worst case of insomnia and have yet to go to sleep...although I am now completely caught up on the entire series of Made in Chelsea (if you haven't watched it you should...although I will warn you it is addictive! ), done lots of laundry, and made an amazing breakfast as compared to the normal Monday morning. However I am completely delirious and worry that what I write (am writing) could make no sense! This is a little sprucing up I did to my brother's apartment on Christmas Day. I realize I have a problem when I am doing home projects on Christmas morning, yet I feel everyones home should be a place they want to come home to so this was a little present to my brother. 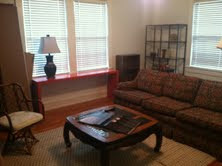 And with the help of my sister and beau we were able to knock this out in about an hour...not a bad update for an hour. Sorry for the iPhone pics. I didn't actually think I would show during shots. 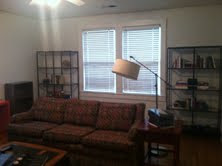 Please ignore the boxes and old bookcase that we did not move out of the way for the pic. The fam was waiting on us to leave for Christmas lunch....oops! I added the metal bookcases (which I already kind of want to steal), some book styling, new lamps, tables, and rug...makes it feel a little cozier. Navy drapes have also since been added! Yay! Now pray I can get some sleep! Check back tomorrow for an AWESOME giveaway!! !